For over a year and a half Colombian trade unionist Rosalba Gaviria Toro has been jailed for "rebellion" by the Colombian authorities. Her real "crimes" are her union and human rights work in the country deemed to be "the most dangerous for trade unionists in the world". The following appeal to petition the Colombia authorities for her release comes from the online labour solidarity site Labour Start. On 9th March 2009 Rosalba Gaviria Toro, a member of FENSUAGRO, the Colombian Agricultural Workers' Trade Union was detained and accused of 'rebellion'. She has been imprisoned since then in Villa Cristina jail in the city of Armenia, without being convicted of any crime. Rosalba has been an active trade unionist and human rights activist for many years, however, the Colombian authorities have described her as a 'terrorist' - jeopardizing her right to a fair judicial process. There is no legitimate evidence against Rosalba and it would seem that, like so many other political prisoners in Colombia, she has been jailed to silence her and prevent her from carrying out her legitimate work in defense of trade union and human rights. Please go to this link to send the following letter to the Colombian authorities. 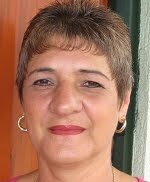 I am writing to express my concern about the case of Rosalba Gaviria Toro, the Colombian trade unionist and human rights defender detained 9th March 2009, accused of "rebellion" and "conspiracy to commit a crime". She has been imprisoned for more than 19 months in Villa Cristina Prison, Armenia, without being convicted of any crime. There is no legitimate evidence against Mrs Gaviria and it therefore appears that her incarceration is politically motivated. It is clear that she is a dedicated trade union activist who has been targeted as a result of her work, like so many other Colombian political prisoners. The practice of detaining members of civil society for their participation in legitimate organisations violates fundamental human rights. We therefore urge you to ensure that Ms. Gaviria is given a fair trial and that she is released as her innocence demands. Labels: Colombia, international labour, Labour Start, labour., repression, Rosalba Gaviria Toro, solidarity.